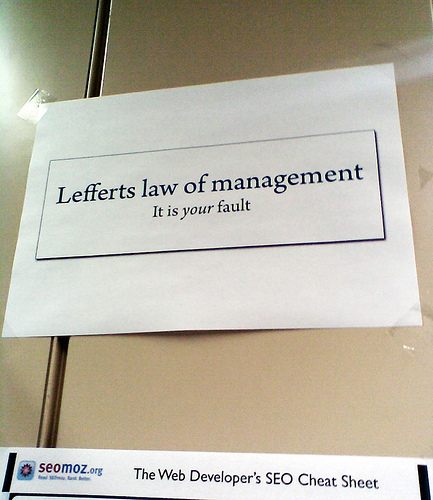 The Lefferts law of management: It is your fault. As a person with more power than the people who work for you, there are probably a dozen excuses in any situation for why things are not going well: don’t use them. If you need more help, it’s your job to ask for it. If someone let you down, it’s your job to plan better next time or find a way to recover. If you are the bottleneck, it’s your fault for not delegating more. Whatever the thing is that isn’t going well, you are the primary person to do something about it. If you’re not sure what to do, it’s your job to ask others for advice. This law should be the primary working assumption in trying to understand a situation. Certainly there will be many cases where someone else is at fault, but start your diagnosis by assuming otherwise. If you have the title ‘manager’ in your name you should tend to absorb blame for what’s going on, while distributing the rewards. When all else fails, be the fall guy. If people see you take enough bullets for them, soon they’ll be taking some for you. Being passionately accountable creates a shield for others and makes it safer for them to invest more personal responsibility in their work. When they do, things can only get better. When in doubt, good managers assume anything important that’s not going well is their fault and do something about it. Gina Black April 29, 2008 at 12:08 pm. Permalink. This works with parenting too. Eddie April 29, 2008 at 7:32 pm. Permalink. Nikolay April 29, 2008 at 10:08 pm. Permalink. And actually pragmatic programmers have similar advise in their book. Jan April 30, 2008 at 2:01 am. Permalink. In many situations in large organizations there are groups ‘collaborating’ on a project. These groups are often filled with workers with sloppy shoulders and managers trying to align themselves with the next big win and distance themselves form (often their own) failures. Sorry, but I just don’t think this is valid advice for everyone. Martin April 30, 2008 at 3:27 am. Permalink. I would add to Jan’s comments my viewpoint. Eric April 30, 2008 at 6:20 am. Permalink. While taking responsibility is important, I think your last comment of “do something about it” is even more important. If somebody takes the blame for things without taking action, they look incompetent. Conversely, somebody who takes action on things that aren’t their fault looks like a proactive leader. So I almost wonder if the advice should be to take action rather than to accept blame. NathanaelB May 14, 2008 at 11:21 pm. Permalink. Scott Berkun June 29, 2009 at 9:30 am. Permalink. Jennifer July 22, 2011 at 1:23 pm. Permalink. Agree almost 100%. The only drawback to this is that what one perceives as a ‘problem’ may only be a problem to that person alone, which leads to micro-managing. First, you need to ensure there really is a problem to be resolved, not just a difference of opinion on how something should be executed. Then, work with your employees / teammates to find a resolution that doesn’t alienate anyone (or as few as possible). See, I’m in a position right now where my director (one step down from VP) thinks she can do everyone’s job better than them. What she perceives as problems only exist as such in her own mind. Thus, the “problem” shifts to us, her employees. I’m a firm believer that in life, if you have an issue with something, you’re the only one who can fix it. But, when it comes to working with others, you need to decide first if the issue is within yourself or shared with others. Scott Berkun July 22, 2011 at 1:55 pm. Permalink. Jennifer: I agree. The goal is to do this without micromanaging. John K July 25, 2011 at 11:44 pm. Permalink. No offense to the ladies reading this – I always thought that part of “the mark of being a man” included taking responsibility for your role + actions. since when did that change such that we need a law to remind managers (pre-dominantly male, by the way) that they need to be responsible? back when i was serving in the military, I had a good “manager” (a senior warrant officer, to be exact). He was harsh, demanding and the nightmare of every enlisted man. I learnt however that he led by example, and never pushed the blame (when things go wrong) even though he could have pushed it on us. Though he was rather stingy with his rewards, his men respected and loved him for his trustable leadership. I see a very sad lack of leadership, esp in the IT/comp science sector – but i think everyone can see that.